This radical new Buddhist book challenges many entrenched Western ideas about what Buddhism is and shines a light on its relationship with ideas from the contemporary worlds of both science and politics. Lama Jampa Thaye’s new buddhist book considers the space for Buddhism in our culture – a space that has been opened up by the failure of our dominant systems of thought to provide an intelligent account of what it is to be human and how we should conduct ourselves in this world. We live in a time when it can appear that the road to wisdom has been lost and its very existence forgotten. In its place is merely a dead-end street full of stale ideologies. Yet the path that Buddha set forth some two-and- a-half millennia ago is still there for us, even in these modern times, if we care to find it. This present work is essentially a series of essays on the encounter between Buddhist teachings and the West. However, it is not a formal introduction to Buddhism nor a systematic exposition of Buddhist thought. There are many of these available. Neither does it claim to represent the whole of Buddhism. Inevitably, it reflects my understanding of the particular set of teachings and practices in which I have been trained by my Tibetan masters. Buddhism itself developed out of the teachings given by the warm and friendly South Asian prince known to his followers as ‘The Sage of the Shakyas’. At the heart of these teachings is the insight that suffering arises primarily from our mistaken ideas about ourselves and the nature of the world – errors that prompt the arising of a confluence of disturbing emotions and actions. According to Buddha, liberation from suffering is always possible, through the transformation of our error into understanding, brought about by training in the three-fold path of ethics, meditation and wisdom. Thus, despite its ancient origins, Buddhism would seem to be uniquely well suited to the modern world. The first half of this work considers the space that now exists for Buddhism in our culture. This is a space that has been opened up by the failure of our dominant systems of thought to provide an intelligent account of what it is to be human and how we should conduct ourselves in this world. However, although this space exists, if Buddhism is to fill it effectively, the temptation to assimilate it to contemporary ideologies must be resisted. Nothing could be more destructive for Buddhism in the long run. With this point in mind, the latter chapters of this book consider how best the Buddha’s teachings might be understood and practised today. There has been considerable enthusiasm directed to these subjects, but it is vital that we discriminate between authentic and fake presentations, the latter being those proffered by self-appointed authorities, which are thus unconnected with the unbroken traditions of teaching and practice, and, furthermore, whose presentations are refuted by direct experience or reasoning. All too often, through a mixture of conceit and credulity, we have settled for the latter. Unfortunately, if we persist in getting Buddhism wrong in this way, the opportunity for it to shape our lives will be lost and Buddhism itself is likely to remain in cultural memory as nothing more than a temporary fad – another Theosophy. 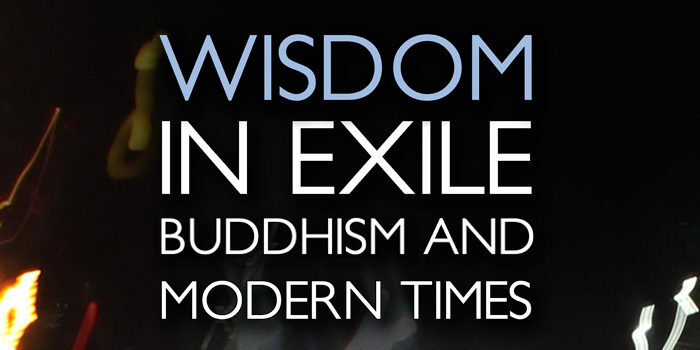 Wisdom in Exile draws from the teachings I have received over the past five decades from His Holiness the 41st Sakya Trizin, Karma Thinley Rinpoche and various other Tibetan teachers, and, as such, it refers extensively to works composed by eminent masters of the Buddhist tradition. Therefore I’ve included a list of these masters at the end of this book, if only to make their names a little better known.